Cottage making up opposite end of a fine U shaped C19th farm building on a quiet estate of some 200 hectares. View over the pool and large grounds. Peaceful area. We had a lovely stay with Valerie & Landry at their farm in St-Gery. The apartment is spacious and the kitchen is very well equipped. It really has everything you need. The garden is large and extremely well maintained and our children were able to run around without any problems or fear for their safety. A large sandpit and new climbing frame had just been set up before we arrived and the kids made ample use of all the facilities. The swimming pool is very clean and enclosed by a large gate which was great for us as we didn't have to constantly keep an eye on our children, aged 2 and 4. For us adults there was badminton and table tennis, so plenty to do. Valerie and Landry run a biological chicken farm which was great as we had delicious fresh eggs for breakfast a couple of times. We witnessed a tremendous electrical storm and some bad weather that caused the wifi to shut down a couple of times during our stay. But after telling Valerie is was up and running in no time. The only thing that would have been nice is if the sun loungers had been equipped with some cushions as these were rather uncomfortable without them and were therefor not used. As for the surrounding area, Perigueux, which is about 45 minutes away by car, is really worth a visit and Bergerac is 20 minutes drive from the house. If you want a quiet holiday suitable for children then this is definitely recommended. Have good time with your family. Der Aufenthalt war einfach nur ein Traum!! Für jede Familie ein Urlaubsparadies!! Wir waren mit 2 Familien "vor Ort" (4 Erwachsene und 4 Kinder). Und ich kann wirklich nur sagen, es war der perfekte Urlaub. Bei der Buchung hatte ich zunächst Bedenken, weil ich kein Französisch spreche und die Vermieter kein Englisch oder Deutsch (lt. Website). Aber das stellte sich als Trugschluss heraus. Die Vermieterin beherrschte ein besseres Englisch als ich, von daher konnten wir gut sprechen. Das Haus war optimal eingerichtet. Es war alles vorhanden, genau wie es in der Beschreibung steht. Ob es deutsches Fernsehen gab, kann ich leider nicht sagen, ich habe es nicht getestet. Der Pool ist wirklich einmalig schön. Diesen teilt man sich mit einem zweiten (kleineren) Ferienhaus und ab und zu den Eigentümern. Aber das machte überhaupt nichts. Man konnte ihn zu jeder Tages- und Nachtzeit benutzen. Überhaupt hatten wir keine Probleme vor Ort. Im Gegenteil. Wir waren überrascht, dass unser Feriendomizil ein echter Bauernhof war. Dort gab es Hühner, einen sehr netten Hund, eine Katze und sehr, sehr viele Kühe. Der Hof beliefert ein Sternerestaurant mit Rindfleisch. Man kann dieses (Bio!) und auch Eier erwerben. Das Rindfleisch kann ich mehr als empfehlen! Es ist traumhaft zart! Wir haben dementsprechend sehr oft gegrillt! Das W-LAN stand etwa 3 Tage super zur Verfügung mit einer guten Bandbreite. Die restlichen 11 Tage allerdings konnte man damit nicht viel anfangen. Wenn man aber keine Videos runterladen "muss" ist das kein Beinbruch. WhatsApp Text-Nachrichten oder E-Mail funktionierten auch so. In der näheren Umgebung gab es allerdings nicht so viel zu "entdecken" oder zu unternehmen. Das war für uns nicht so schlimm, da wir mit dem Auto vor Ort waren. Ich gehe aber davon aus, dass niemand dort ohne Wagen Urlaub machen wird, daher auch hier kein Punktabzug. Neben dem Pool haben wir viel Zeit an der Tischtennisplatte (das älteste Kind war 14) und auf dem Spielplatz (das jüngste Kind war 5) verbracht. Es ist daher für jeden etwas dabei. Auch bei der Einrichtung insgesamt und WC/Dusche ist nichts zu bemängeln. Fazit: SUPER, eine totale Empfehlung!! It was great pleasure to welcome you on Paufy... See you soon !! From the arrival we were warmly greeted. The pictures on line didn't do justice to how beautiful the setting was. The gite was much larger than we had anticipated and was spotless. The facilities were perfect especially for our 3 year old granddaughter who was able to run around safely. She really enjoyed seeing all the animals on the farm. 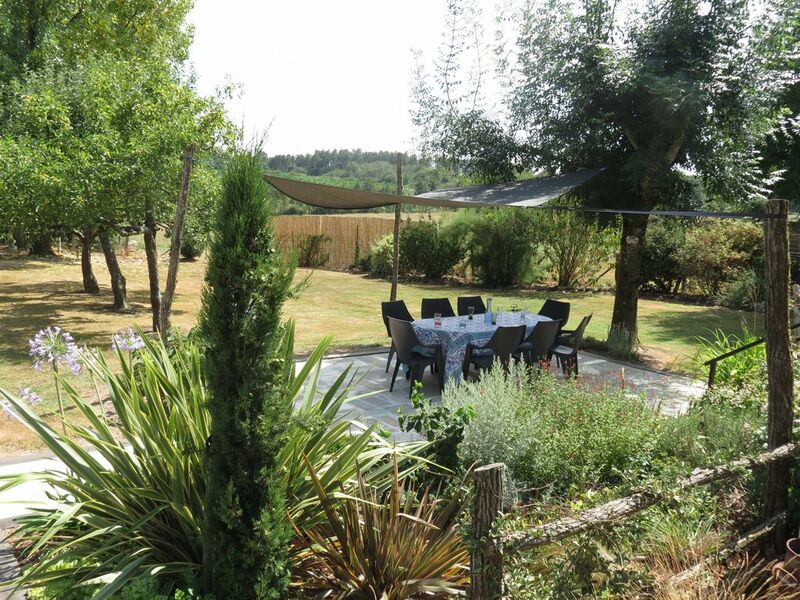 The gite is very well placed for easy access to visit many places of interest and although in a very rural location, the supermarket is only 10 mins away. Perfect. Many thanks to Valerie and all the family for making our stay so enjoyable. We have no hesitation in recommending this gite to others. En un entorno muy tranquilo e idílico estuvimos una semana el pasado agosto. La casa está muy equipada, su entorno invita a la tranquilidad y la piscina y el espacio para los niños junto con la amabilidad de sus propietarios hace que sea un lujo. Nous avons passé un super séjour en famille au gîte "vert pré". Malgré un temps moyen, la qualité de ce gîte nous a permis de passer de très bons moments avec nos enfants et petits enfants. L’accueil est très sympathique, le gîte est propre et spacieux. Quand à l'environnement c'est top ! Le calme et la beauté de la campagne. Pour les enfants c'est idéal avec la piscine et les aires de jeux bien adaptées sans parler des poules, lapins .... et les légumes du potager !!! !